Often, it can be quite stressful and complicated when organising an event and trying to find a time that works well for everyone involved. Using paper, pens and one’s memory to find a suitable time slot can quickly descend into chaos and confusion. 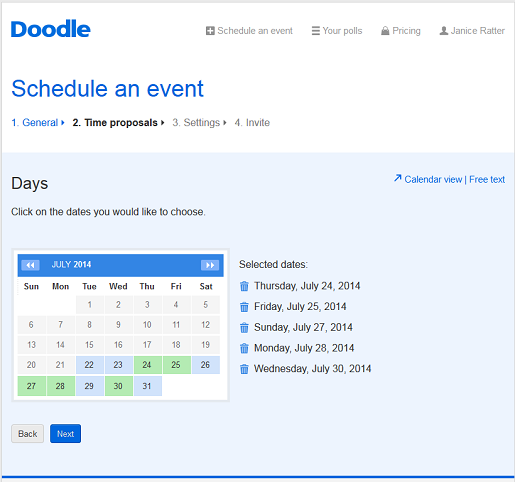 Doodle is online polling tool which allows you to quickly find the best time for everyone to meet. 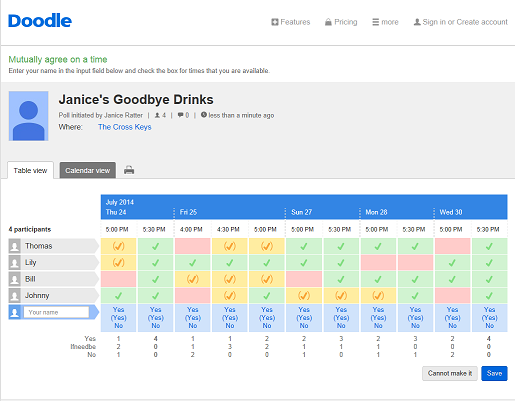 Whether you are arranging a surprise birthday party, a meeting at work or perhaps a larger event like a lecture or an information or induction day, by using the Doodle poll tool you will be able to find out everyone’s available time slots with minimum hassle. 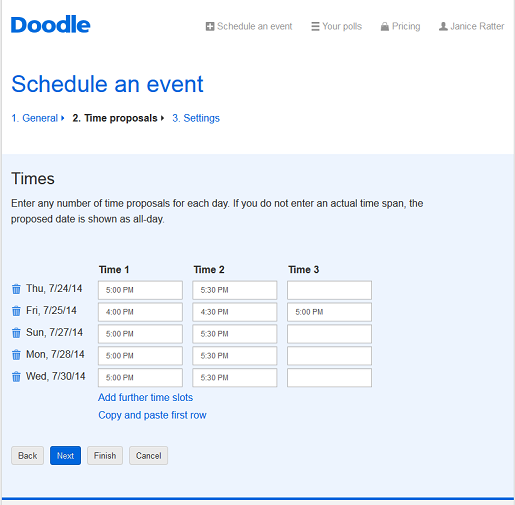 On Doodle you can create a quick poll in minutes, outlining the basic details of the events and the potential times you can meet. You can invite people to participate in the poll and mark down the times and days that they are available. Once all your invitees have participated in the poll, Doodle will notify you and display the most convenient time for all. With this free online polling tool chaos and confusion is replaced by clarity and ease. The Doodle online poll tool is remarkably easy to use. Once you are on the site you simple need to click on the button that says, ‘Schedule an Event’ and then follow the instructions in four simple steps. First off you will be asked to enter some basic details such as the name of the event, the location and a description. 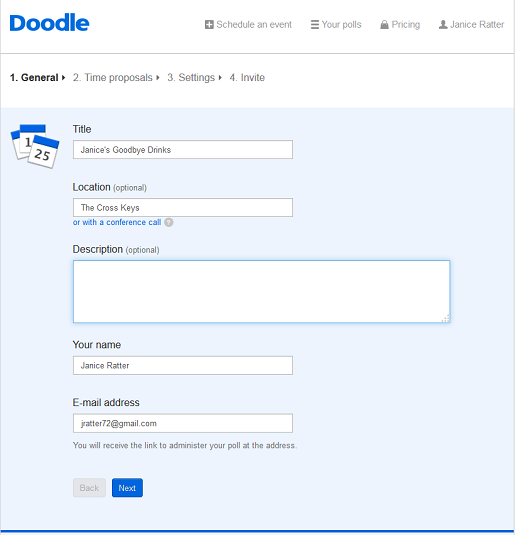 If you haven’t already registered a free account with Doodle, you will need to add in your own name and email address to establish yourself as the administrator. You will be able to edit the poll once it has gone live, as well as receive updates when each invitee participates in the poll. After this you will be asked to select possible days and times to meet. Once this is completed you will be given the chance to add extra settings and features. For example, you can give your participants the option to answer ‘Ifneedbe’ as well as ‘Yes’ and ‘No’. At this point you can invite people to participate in the poll. 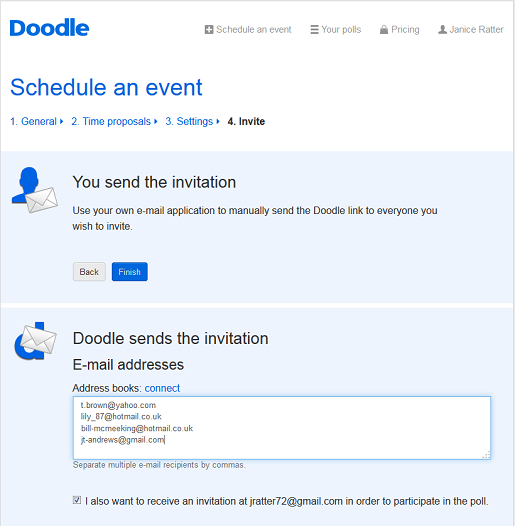 Unlike most other polling tools, on Doodle you can invite participants via email, Facebook or Twitter. While using social media is handy for a larger event, inviting participants via email is more succinct for a smaller event. You are also able to import contact from your email account if you so wish. In the end you will be able to see the best time for everyone. In the example below, Friday 25th or Wednesday 30th at 5.30 would be the optimum time to meet. In addition to the basic online polling tool, Doodle offer you fun and handy little adds-on and extra features to ensure you get the most out of the Doodle experience. If you have an online calendar or planner you will be able to connect that to your Doodle account so you do not have to constantly switch between the two when participating in someone else’s poll. 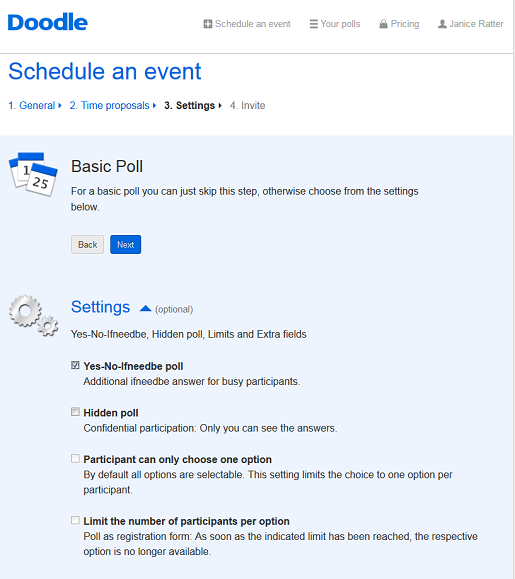 With the free online poll tool you can also allow your invitees to write comments on the poll and to set up time-zone support if you are arranging a conference call with participants across the globe.